Whether you’re going up to the chilly north this holiday season or heading down to a tropical island, there exists a better way to take care of yourself than the generic self care items that’ll come with your hotel room. Nothing will ruin your vacation faster than having to use common products outside of your comfort zone. Luckily, you’re not alone, and great options exist for a homestyle routine that can be done on the go. During your vacation this winter, let Aesop’s Jet Set Kit provide you with 4 different travel-sized hair and body products meant to keep you on the right track when you’re forced to shake up your personal routine. An even split of two hair products and two body, you’ll be feeling as refreshed as if you had your entire collection of products from back home at your disposal. Intended to keep your hair shiny and soft to the touch, the first product of your new travel-sized collection is the “Classic Shampoo.” An infusion of Rosemary Leaf and Cedarwood Bark, you only need a tiny drop before your entire scalp is rinsed and you’re ready to move on. Talk about easy, right? Although the $41 price tag may seem a little steep for a travel kit, the 1.7 oz. bottles are all intended to be used sparingly. With only a few drops necessary each time, the kit will be sure to last you many trips to come. Feeling at home yet? We’re only a quarter of the way done. Once your Classic Shampoo is rinsed out and you’re ready to really show the personality in your hair, move on to the “Classic Conditioner.” Similar to the last step in that only a drop or two is needed, you’ll be looking just as great as if you owned a high-end product. Conditioners are like the flossing of hair-care; important but easy to forget. It can depend on your hair type. If you have shorter hair, it may not be as necessary to use conditioner on a consistent basis, but if you’re rocking long hair this season you best make sure it’s smelling nice! What’s the point of washing your hair clean if it doesn’t shine like it should? You owe it to yourself to feel confident and comfortable during your time off, and these two hair products are a great start. However, we aren’t done yet. Now that your locks are looking up to par and your focus can shift to other matters, it’s time to move on to some body products. Naturally, at this point you’ll notice a difference between how fresh your hair is feeling and how… not your body is. 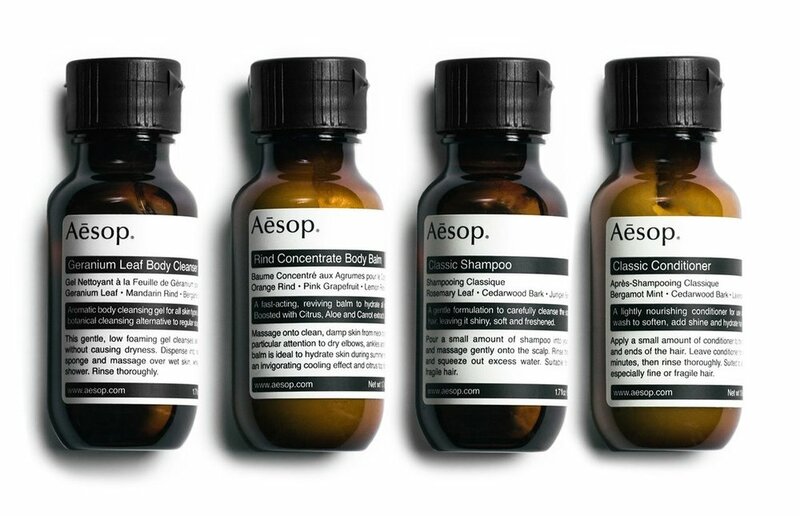 The best way to remedy this situation is to take advantage of the rest of Aesop’s Jet Set Kit and its two complimenting cleanser and body balm products, meant to give you that extra push. You’ve come this far, why not finish strong? A full body cleanser, you can be a little more generous in applying “Geranium Leaf Body Cleanser” to yourself. Don’t be afraid to really explore other places on your body like arms and legs. Get your money’s worth! If you’re facing some weather during your trip abroad that you may not be accustomed to, apply this to feel refreshed no matter the climate. Just because your buddies are okay with using generic hotel products on their vacations doesn’t mean you have to, and this body-cleansing gel will definitely keep you ahead of the curve. Phew. Still with us? Let’s talk about the pièce de résistance of the mini travel kit. Last but definitely not least, we have the “Rind Concentrate Body Balm.” A moisturizer meant to be massaged from top to bottom, this product is fast acting and will be the perfect cherry on top to your vacation’s routine, especially if you’re traveling somewhere with a warmer climate which could cause you to be more susceptible to drier skin. It may make you wonder if this should be your regular self care product, not just an extra option on vacation. Just because you’re traveling doesn’t mean you have to let your entire routine go. With just a little adaption and some extra work, you can achieve the same self care quality that you’re used to at home.